I seem to have always known blood clots were a serious health concern – especially if you had one in your heart, lungs or brain. I heard about them in the general sense; for example, when discussing the elderly who had passed away or when talking about recovery from a major surgery or hospitalization. I didn’t know the signs or symptoms; that fatality from a blood clot could happen within moments of the first symptoms; or that it would ever happen to me at 29 years old and as an active runner. I thought I had a simple running injury and if I had known the symptoms, it may have made the difference between a treatable Deep Vein Thrombosis (DVT), behind my left knee, and the Pulmonary Embolism (PE) that went to my lung and almost killed me. It was nearly two days since my calf started to hurt until I went to the Emergency Room, breathless and in excruciating pain, both in my leg and side. I couldn’t believe the extent of the injury to my body, mind and emotions. It completely changed my life – no aspect was left untouched. And the thing is, other people – like me and unlike me – don’t know or don’t think it can happen to them. March is Blood Clot Awareness Month and as a blood clot survivor, I am doing everything I can to spread awareness about this deadly and often treatable injury. I know they majority of people I know do not understand what I went through during my PE and recovery. They do not understand my physical pain and how I could look okay in spite of it. They do not understand that I took almost a month before I could even breathe without the assistance of an oxygen tank and how I went from running several times a week to not even being able to walk from one room to another. They do not understand how I could not use the bathroom by myself in the hospital, that I was in a hospital room well-equipped for medical personnel to take life-saving measures at a moment’s notice or that I couldn’t even sit up for days on end. They do not understand how my personal relationships, professional life and self-confidence suffered, some to irrevocable ends. I attribute most of this to the fact that many people simply do not understand blood clots and the damage they cause to the body. People understand what it means to have a heart attack, stroke or cancer, but they do not often understand what it means to have a blood clot. They also do not understand that it could happen to them. I am trying to change that and help spread awareness not only for Blood Clot Awareness Month, but always. Consider this post a crash-course in blood clots and while it is in no way all-inclusive, I hope to present to some useful information for you or others you may know who don’t understand what happens when a person has a blood clot. Share it, print it or post it! Let’s get the word out about this silent killer. Blood clots (DVT and PE) affect am estimated 900,000 Americans each year (Source). Blood clots (DVT and PE) kill an estimated 300,000 Americans each year. The number of deaths from blood clots exceeds those from breast cancer, AIDS,and motor vehicle accidents combined (Source). Blood clots are the leading cause of maternal deaths in the United States (Source). 10 to 30 percent of people affected by DVT/PE will die within one month of diagnosis. Can get a blood clot? Anyone can develop a blood clot for a variety of reasons. There are many risk factors that increase your risk for a blood clot (see below for more detail). In a nutshell, you are at increased risk if you or a close family member have had a blood clot before; you have had recent major surgery; you have an inherited clotting condition; have cancer; are immobile for a long time (confined to bed, long-duration plane or car trip, etc. ), or use birth control pills. It’s important to understand your own personal risk and also that anyone can develop a DVT at any time. Most commonly treats a blood clot? Patients commonly see their general practitioner for treatment of a blood clot, but can also see a pulmonologist, cardiologist or hematologist. A hematologist is best equipped to handle ongoing care particularly if the patient has a clotting factor or other blood condition/disease contributing to the blood clot. Is a DVT? DVT (short for Deep Vein Thrombosis) is a type of clot that forms in a major vein of the leg or, less commonly, in the arms, pelvis, or other large veins in the body. Is a PE? DVT can develop into PE (short for Pulmonary Embolism), a dangerous condition in which the clot detaches from its point of origin and travels through the bloodstream to the lungs, where it becomes stuck and prevents blood flow. Causes a blood clot? Blood clots may form when either the flow of blood in a vein slows, damage to a vein occurs, or the blood is more clottable (such as with a genetic or autoimmune factor already in the body/blood). Is a blood thinner? Also called an anticoagulant, a blood thinner helps to prevent clots from forming in the blood. They include medicines like aspirin, clopidogrel or Plavix, Warfarin — more commonly known as coumadin — and a variety of other medications that are used in the hospital setting, including injections like Heparin and Lovenox. Happens after someone is diagnosed with a PE/DVT? Often times, a person is admitted to the hospital, especially if he or she is experiencing a PE. They are usually put through a variety of blood and imaging tests to check for high blood clotting factors in the blood (D-Dimer) and actual blood clots (Dopplar Imaging scan). Patients are usually put on blood thinners of some sort as soon as possible. Patients are often treated with pain reliving drugs and sometimes surgery is performed to remove the clot or place a filter to stop the clot from moving (usually in the groin), but these procedures are not always performed. Does it mean if someone has a clotting factor? If someone says they have a clotting factor, it usually means they have a genetic (an example would be Factor V Leiden ) or autoimmune (an example would be Antiphospholipid Syndrome) mutation or condition that causes their blood to clot when it should not. Can you develop a blood clot? You can develop a blood clot anywhere you have veins, but they are most commonly in the leg and less commonly in the arms, pelvis or other large veins of the body. Is a blood clot so damaging? A blood clot is damaging because, depending on it’s path, it can cause great trauma to the body’s circulatory system, including the heart. It takes time and energy for the body to heal damage done to the heart and lungs, even if it is micro-damage. A PE is consider a traumatic event for a person’s body to go through. Isn’t there more public awareness about DVT/PE? A lot of times blood clots are not named as the cause of death because a person may have also suffered from underlying conditions, such as cancer. There seems to be more public energy focused on educating people about heart disease, diabetes and cancer, yet organizations like the National Blood Clot Alliance (Stop the Clot) and Clot Connect are making great strides to raise awareness. More recently celebrities such as NACAR’S Champion Driver Brian Vickers, 2010 Olympian, and two time US Sprint Champion, and a Master Sprint World Champion in Speed Skating Rebekah Bradford and Reality TV Star NeNe Leakes have spoken out about their personal encounters with blood clots to help bring awareness to the public. Long does it take for someone to recover from a DVT/PE? Recovery from a DVT and/or PE varies greatly from individual to individual and can take anywhere from several weeks to a year or more. Some people will face complications from DVT, including Postthrombotic Syndrome (PTS) for the rest of their lives. Can I prevent a blood clot? The good news is, yes, there are many things you can do to help prevent a blood clot. Stay active. Immobility increases the risk of developing clots. If you’ve been sitting for a long period of time (such as at your desk or while traveling) stretch your legs often; Maintain an ideal body weight; Know your risk factors for developing a clot (see below) and discuss with your doctor; Know your family medical history; If you are hospitalized or planning for surgery, ask your about what will be done to prevent blood clots (such as being placed on blood thinners or wearing anti-embolism, also called compression, stockings). One-half of clot patients will have long-term complications and one-third will have a recurrence within 10 years (Source). An estimated $10 billion in medical costs in the US each year can be attributed to DVT and PE (Source). Blood clots are a treatable condition and often preventable condition. Deep red is the awareness ribbon color for blood clots, including DVT. Red and white (together) is the awareness ribbon color for PE. Burgundy is the awareness ribbon color for clotting disorders. If you are at all concerned or have any of the symptoms listed above, make an appointment with your primary care physician or visit your local emergency room. PE is life-threatening, seek emergency medical care immediately or call 9-1-1. What Everyone Should Know About Blood Clots Quick Reference Guide for important information you can access in a hurry. 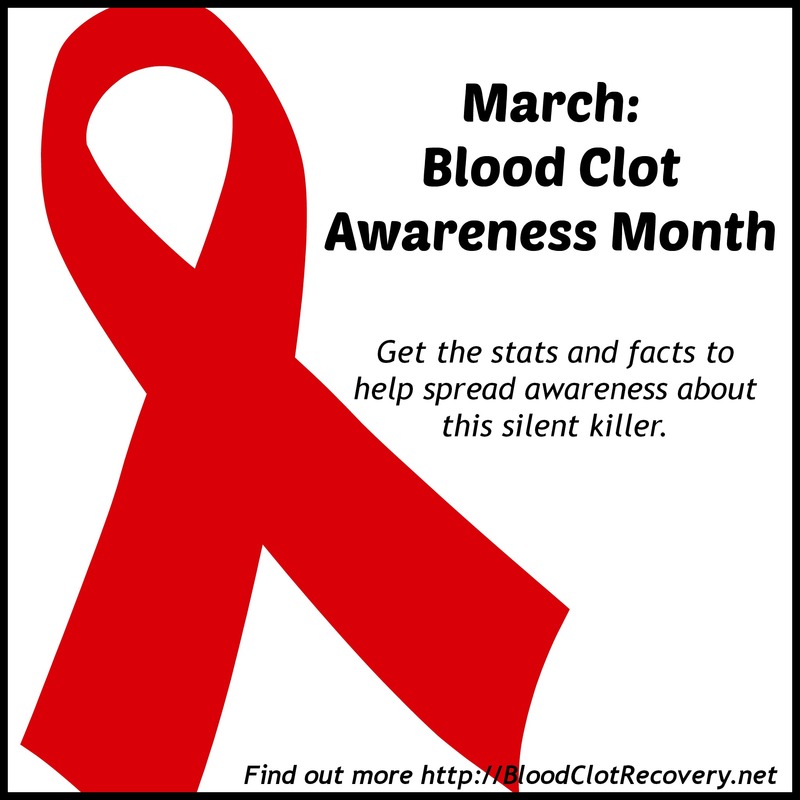 Blood Clot Recovery Network on Facebook throughout March for support, awareness facts and images (including a Facebook Cover and Profile Image picture) to share!